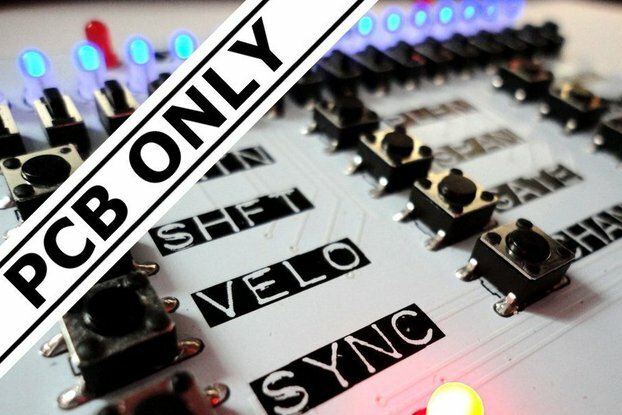 An unique MIDI control surface that functions something like a cross between a Stylophone and an Omnichord. An optional stand is available. This little gizmo, just wow! Well laid out pcb, very good docs, doozy to solder.... and it work brilliantly too! This thing rocks, it rolls, it arpeggiates and meanders, it begs to be modded, it pleads to be experimented with, brilliant little giant. This kit went together very well. I studied electrical engineering in school, but that knowledge is unnecessary to build this kit. The instructions are very thorough and include pictures to ensure that the polarized components are oriented correctly. The PCB quality is one of best I have seen in a kit after constructing a variety of projects. I would recommend a good soldering iron, as with any project like this, to make sure that the solder flows easily and quickly. The unit functioned properly on the first power-up and did not require any debugging or calibration to get started. the case could be improved to include a bottom panel and rubber feet like those on the Arpie, but for the price point, it's hard to be dissatisfied. It was a pleasure to build, really well documented with images and well written instructions , fast shipping and good packing. And the product works like a charm. Perfect. Thanks a lot! When i've plugged it on my live configuration it was so awesome !! All the fonction are usefull ! Le strum can be expanded to utilise your own control surface and is also hackable,I enjoyed building it and also using it,well done. This is just total fun. Fun to build, fun to play. Everyone who has seen it has just wanted a go and said how cool it is. 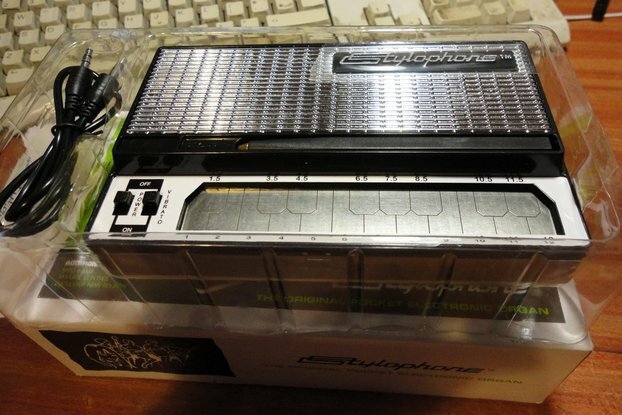 I am looking forward to customising it a little and integrating it into my rig. Great job! Was easy to assemble. Clear instructions and parts fit well. Worked first time around. Would highly recommend. I've got very little electronics experience - the only other kit I've attempted was a Drawdio. This is a bit more involved! As it turns out, it was easy to put together - it was up and running as soon as I powered it up and plugged in a synth (a Waldorf Streichfett). I'd managed to bend one of the IC pins so the midi indicator LED wasn't working, but a quick fiddle and I was up and running. Le Strum was made for the Streichfett - it's got huge polyphony and a huge sound - both together are amazing!!! I'm already thinking about making a bigger, more ergonomic case for it and using real strings. All in all, a fantastic kit Highly recommended. Pocket Omni-Chord for any MIDI synth... Ahh!! So Nice. Even iPad obsessed children take a break to give it a go. Does exactly what it needs to do... 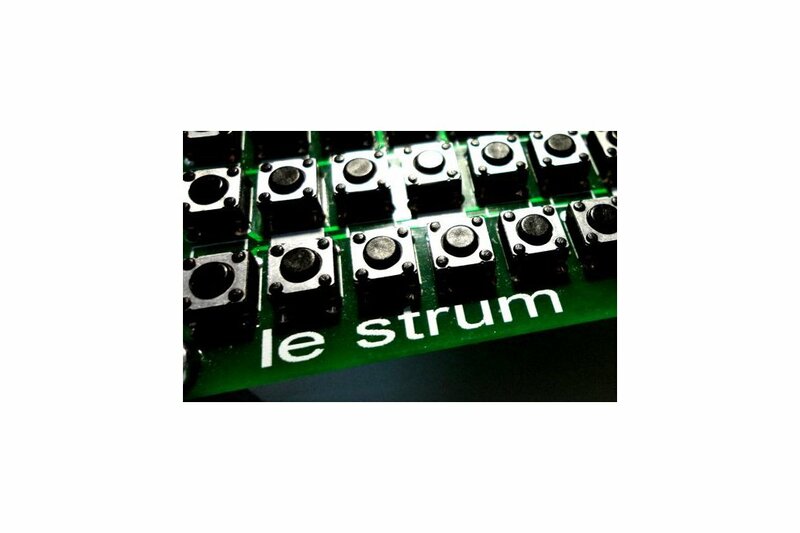 If you want to strum your synthetic sounds and play like an angel, you need LeStrum. This is a very simple and well documented build. The person(s) who designed and packaged this did it with care and love for what he/she does. Feels great to receive this. Small package (cheap shipping), easy to solder, great instructions, AWESOME wiki (further hacks are encouraged). Comes with printed intuitive manual so you can get LE Strumming right away! I'm not experienced at soldering but having done one project I found no problems with this. The finished kit is sturdy, very small and very cute. As a controller it is like nothing else out there and is a lot of fun to use. This was a very well put-together kit. Everything was included (even a few extras of this and that) and the kit went together relatively quickly. I would say that I'm an intermediate-level assembler of soldered kits and this took me about 1.5 hours to put together. You will need an iron with a fine point, but that's a given with this type of assembly. Once assembled the controller works flawlessly. I haven't had a chance to use it very much yet - I just connected the DIN-out to a midi to USB interface and ran that to GarageBand on my MB Pro. The number of preset settings packed into the device is really impressive and I've been having a lot of fun with the various guitar modes. Outstanding! Thanks for taking the time to create and share this.